YouTubing professionally has become a viable career path thanks to Adsense. Where it once offered little to no pay, now YouTubers can earn a living, or at least a stable side income. The problem that this raises though is an acute one. Modern 1080p video files tend to be rather large and take up a lot of space on one’s hard drive. 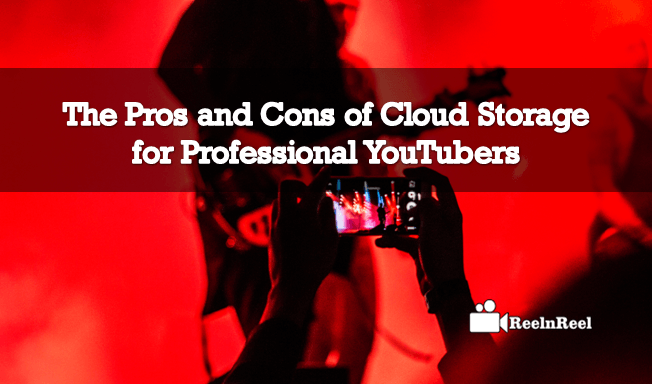 here are The Pros and Cons of Cloud Storage for Professional YouTubers. This poses a problem to YouTubers both large and small simply because the average hard drive isn’t large enough to accommodate the library of videos that one can build up over the long term. Of course, one could always delete their videos. However, this can be something of a risky proposition due to the ever-changing nature of YouTube’s community guidelines. One could very easily find themselves in a situation where all of their work is suddenly lost in the ether, making backups of your files essential. Modern alternative methods of storage, chiefly USB sticks and external hard drives, can be prohibitively expensive for some, and are themselves prone to mechanical failures over time. There is, however, an alternative: cloud storage. Some are considering cloud storage to be the future of their workflow. Services such as Dropbox, Google Drive, iDrive, and Microsoft One Drive enable users to store and access their files from any machine capable of connecting to the Internet. It even enables you to upload videos directly from your phone. Rather than uploading a video to your PC, editing it, uploading it, and then saving the finished product to an external storage device, it can all be shot, stored, edited, uploaded, and saved from the same place. Many of these services offer free storage, and options to purchase more as your needs change. None of this is to say that cloud computing ought to be the be all, end all of the storage. Information security should be taken into consideration when using these services, as a hack is not beyond the realms of possibility. There is also the potential for an error on the server side to cause your files to become corrupted. Despite the convenience of cloud storage, it is still advisable to have your files backed up on at least one external source to minimize the risk of data loss.